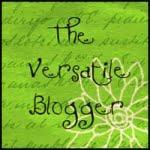 Loressa at Curious Wisdom and Other Every Day Practicalities gave me this "Versatile Blogger" award. I'll go with 7 weird food things about me. I don't like to peel oranges with my fingers. The thought of getting it under my nails makes me want to shudder. Award 10 versatile blogs with the award and notify them of the award. Hmmm I always feel kind of weird with the awards thing. I think I'll just tell you ten of my favorite blogs and then if they want the award they can take it? Straight Up No Chaser I look for her blog first before I read anyone else's every day. Diet Coke Rocks The daily life of Chris from New Zealand. LOVE! Annster's Domain She's in work out mode right now but she blogs about all kinds of things and works in nature, which is awesome! Ashley Quite Frankly has two adorable boys who say the funnies things. Saucy's Sprinkles cupcake extraordinaire. Seriously, they are awesome. Juggling Life has 4 children with the last one getting ready to fly. and one more, my good friend Mary at Rufflebutts. She has the most adorable little girls, big girls and 2 little grandsons. Julie that is so nice of you!!! that's funny and sad because dried fruit is so damn good! But that just means more for me. I must check out some of the other ones you have listed! So I can pass on my magazine..
Windy windy and the Eye Dr. It's kind of cold out there! Mom's 60th Sock Hop Party Party 2! Inking Up-18 Year Old Birthday Present?